Many patients inquire about options that are nonsurgical for the fat that is present in the chin area. Often times, this fat is hereditary and difficult to lose with diet and exercise. 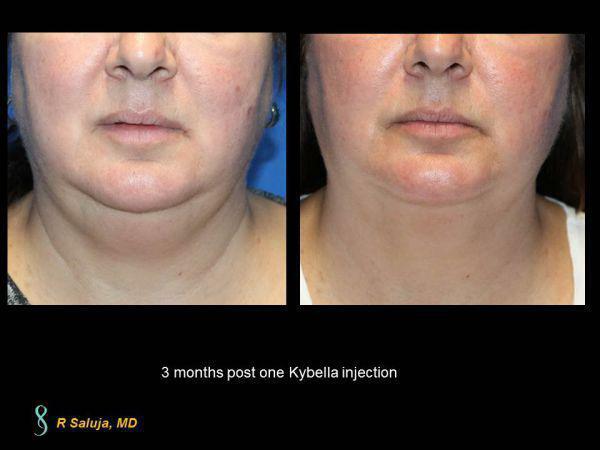 One option for this stubborn fat that Dr. Saluja offers is Kybella injections. All injections are performed by Dr. Saluja and typically 2-4 sessions are needed (separated by 2-3 months). This patient is status post one injection of Kybella. While she will need an additional injection, the clinical reduction in fat under the chin is evident. This patient is four months post one Kybella injection for the fat under the chin (submental fat). Typically 2 to 4 treatments are needed and typically separated by 2-4 months.